When folk singer Pete Seeger and some friends launched the Clearwater project in 1969, the Hudson River was an open sewer for industries, cities and towns along its majestic sweep from the Adirondack Mountains to New York Bay. 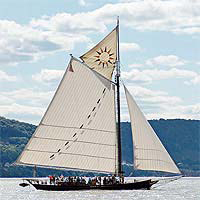 In the years since, the full-sail sight of the Clearwater sloop tacking up and down the river with a pickup crew of excited kids and adults has been paced by outbursts of activism on shore that has prodded cleanups and publicly targeted the major sources of pollution. The inspiration for this hearty brand of environmental activism is a 90-year-old guy who still tramps around with a banjo singing old-fashioned folk songs. In recent weeks, Seeger has energized hand-clapping, standing audiences of all ages in singing grassroots movement songs at a jam-packed high school auditorium in White Plains, NY; the annual Clearwater Festival/Great Hudson River Revival in Croton Point Park; a 90th birthday bash and star-studded Clearwater fundraiser at Madison Square Garden in New York —not to mention, leading the television-watching nation in singing “This Land Is Your Land” at the Lincoln Memorial in Washington, D.C. during the inauguration celebration for President Obama. “I’m more optimistic than I’ve ever been before,” Seeger said at an Earth Day fair at Columbia University’s Teachers College in April, where he was the keynote speaker/entertainer. He said his optimism is fueled by the computer-generated “information revolution,” which has sped up the process of exchanging good ideas. “I now speak with people I never used to speak with—some on the left, some on the right. I think, I believe, we will see more miraculous things happen,” Seeger said. And then he launched into his trademark patter of story-telling songs with an activism hook. Seeger, a World War II army veteran, is an ardent peace activist as well as an environmentalist. In his view, the two issues are not unrelated. When the Clearwater campaign began, a major polluter was the US Military Academy at West Point, which flushed raw sewage into the river at its picturesque site in the Hudson Highlands. In his war protest songs, Seeger prodded the Pentagon to clean up its act in Vietnam, as well. The Clearwater campaign provided potent ammunition for Congress to pass the 1972 Clean Water Act, which forced West Point and Hudson River cities to build modern sewage treatment facilities. Pete Seeger has long been more than a singer with a protest message. He relentlessly organizes people to change things from the way they are: Build a replica of a 19th-century river sloop. Take people out on the river and show them the pollution and where it’s coming from. Raise money to hire scientific experts to testify at public hearings. Mobilize crowds of people to attend public meetings. Organize festivals where musicians and activists can energize each others’ work. At the recent Clearwater Festival at Croton Point, happy concertgoers tramped through mud and rain puddles to hear a baker’s dozen of musical acts—including Arlo Guthrie, Richie Havens, Taj Mahal, and the Hudson River Ramblers—and to also check out the wares at scores of tents set up by activist organizations, handicrafts merchants and food vendors. A Veterans for Peace contingent was setting up its display early Saturday morning when Seeger wandered by, sipping a cup of coffee. Throughout the weekend, he dropped by various events with his banjo and joined in for a song or two. Behind the scenes, Seeger was also overseeing the next step in the Clearwater campaign. Earlier this year, his Hudson River Sloop Clearwater organization announced its “Next Generation Legacy Project.” The first stage is the Clearwater Center for Environmental Leadership, a youth education camping program opening this summer in Beacon, NY. There’s still a state advisory warning about eating fish from the Hudson River. But a major source of contamination is finally being reduced. In May, General Electric began dredging PCBs from a heavily polluted stretch of the river after a decades-long battle with environmentalists. “This has always been a classic grassroots effort, achieved in large part due to the tireless and scientifically-based work of past and present Clearwater staff members and volunteers, our collaborative partners in the Friends of the Clean Hudson Coalition, and the hundreds of thousands of people who wrote letters, signed petitions and cared enough to take action,” said Manna Jo Greene, Clearwater’s environmental director. Meanwhile, the Clearwater campaign fired warning shots in another battle. In March, it filed a contention with the Atomic Safety and Licensing Board “focusing on United Water New York’s application to build a desalination plant to extract water from the Hudson River for use as municipal drinking water for Rockland County.” The Clearwater’s stance is that if river water just downstream of the Indian Point nuclear power plant is to be used as a source of drinking water, the plant owners and the Nuclear Regulatory Commission must re-assess the environmental impacts of the power plant’s license renewal application. That stance sparked an investigative project into the potential for radioactive contamination of the river and area ground water, conducted by environmental students at Ramapo College of New Jersey. The student report concluded that an effective energy conservation program combined with wind and solar power could replace the aging nuclear power plant and negate its potential dangers. Environmentalism, when focused on stopping polluters and cleaning up waterways as Seeger has done is great but environmentalists take things a bit too far when they hamper progress based on their “fear” for the survival of the native habitat and the false fears surrounding nuclear power. Maybe old Pete can be obama’s clean water czar. Well, at least Pete has some relevant experience, and I’m sure he has good poll numbers, too. What’s been done to clean up the Hudson River is fantastic. This strikes me as what environmentalism should be, in the most positive possible sense. I’m much more familiar with the Potomac River. I remember about 30 years ago when it was very dirty, and the Chesapeake Bay, into which the Potomac flows, was in serious trouble, too. My understanding is that after a lot of work over the years, both are in much better shape. The idea that nuclear power plants can be replaced by, or are unnecessary because of the potential of, solar and wind power are little more than environmentalist cant. The facts just don’t support that conclusion. And aside from fictional movies, the non-disaster at Three Mile Island, and the real (but explainable) disaster at Chernobyl, nuclear power plants have an excellent safety record. The biggest issue, which can be dealt with, is disposal of nuclear waste. Overall, nuclear power generation is the answer, at least until there are major breakthroughs in other forms of energy generation, and that’s not going to happen for a very long time, if ever.